Elderly Japanese gardener Mas Arai is at Dodger Stadium to help out his son-in-law and watch Japan play South Korea in the World Baseball Classic. Instead, he finds himself caught up in the mysterious death of a disliked sportswriter. When a young man with ties to Mas’s past arrives, further complicating matters, the pair look to uncover a killer. California writer Naomi Hirahara may have created one of the most unlikely sleuths in mystery history. Mas Arai is nearing eighty years old, a curmudgeonly almost-retired gardener, with only one regular client, a dilapidated car, failing eyesight, dentures, and a house in Altadena filled with his no-longer-estranged daughter and her family. A survivor of Hiroshima, Mas is a simple widower who doesn’t get why the younger generation is so flashy, or needs to talk so much. 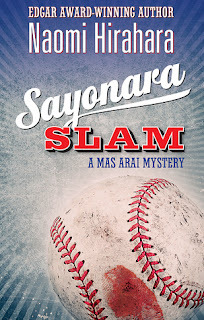 In this sixth instalment in Naomi Hirahara’s Edgar Award-winning series, Mas is helping out his son-in-law Lloyd, now head groundskeeper at Dodger Stadium, before Japan faces South Korea in the World Baseball Classic. What should be a leisurely day sharpening mower blades ends up as something else altogether. First Mas is surprised to see a female pitcher throwing to the Japanese team in warm-ups. Then he meets Smitty Takaya, a Dodgers executive who played in Japan and explains the woman, Neko Kawasaki, is a minor league knuckleballer preparing the Japanese hitters to face Korea’s elite closer, a rare master of the unique, hard-to-hit pitch. The day gets more bizarre as Mas learns there’s a largely forgotten Japanese Garden at Dodger Stadium, and is then questioned by police after an abrasive and disliked Japanese sportswriter, Itai, keels over dead. A man Mas had given a bottle of water to, just minutes before. While the death doesn’t delay the game, things get more complicated when young journalist Kimura Yukikazu arrives from Japan to replace Itai. ‘Yuki’ is the grandson of Akemi, Mas’s childhood girlfriend, and had stayed with Mas and gotten into trouble many years ago. Now he wants to hire Mas as a driver and translator as he investigates Itai’s death. It wasn’t a heart attack, you see, but cyanide poisoning. Files are missing from Itai’s computer. Scandals unexposed. Mas has many doubts about the young man, but he could do with the proffered $100 a day, especially with his daughter, son-in-law, and grandson still living in his house. Then there’s his nebulous relationship with ‘lady friend’ Genesse. Hirahara has crafted a pitch-perfect blend of mystery with threads of history in Sayonara Slam. As Mas and Yuki try to uncover just what got Itai killed, and who killed him, readers get fascinating insights into several lesser-known aspects of Japanese-American and Japanese-Korean history, from wartime internment camps and comfort women to prisoner exchanges and the rise of Asian baseball. To her credit, Hirahara displays a very deft touch, never becoming lecture-y or overwhelming the forward drive of her enthralling mystery. Historic facts are adroitly woven in as texture to the tale. I have to admit I was entranced: everything feels organic, arising from characters and situations, creating a pleasingly multi-layered mystery that is both entertaining and thought-provoking. There was never a sense of an authorial hand wedging research in for effect or to ‘teach the reader’ anything. It just fit naturally. At the same time, Hirahara evinces an atmosphere and pacing that feels leisurely, timeless, almost nostalgic, in a book that is a one-sitting hard-to-put-down read. The pages flow past quickly, but nothing feels hurried or frantic. A modern tale with an old-fashioned feel. At the center of it all is Mas Arai, a truly unique and unforgettable hero. In a forest of familiar crime characters, he stands out; a bonsai among the pines. Though, having said that, in the story itself one of Mas’s traits is that he is a man easily overlooked. A man who, despite his ‘bank robber cool’ tinted glasses, can go unnoticed. What I noticed was a superbly crafted mystery, with an engaging lead character and a strong sense of setting. I can certainly see why the series, centered on a lovable curmudgeon who endearingly fumbles the English language, has won Hirahara the Edgar Award. With shades of Mr Miyagi and various Clint Eastwood latter-career characters, I could also envisage Sayonara Slam translating well to the big screen too. Regardless, I’ll definitely be reading more of the books. Craig Sisterson is a New Zealander who writes features and reviews for publications in several countries. He has interviewed more than 150 crime writers, discussed crime fiction at literary festivals and on radio, is the Judging Convenor of the Ngaio Marsh Award for Best Crime Novel. Follow him on Twitter: @craigsisterson.